There’s no pattern..just the perfect fit for my feet. Sometimes I don’t like busy patterns with variegated yarns…the colors themselves are enough design. But then there’s the cuffs…and I do like a little flair. This pattern is a toe up, figure 8 cast on, fleegle heel, and picot edge for the cuffs. Simple but pretty. I did figure out a trick for the heels though. I was always trying to knit to the exact point where the foot/shin connect, but my socks were a tad too long. Now I stop just about 1/2 before and the heel is nice and snug. Simple, easy wins are great. Gotta enjoy them! This entry was posted in knitting, Quick Projects, Spinning and tagged handknit, handknit socks, handspun, knitting, Spinning by Leah. Bookmark the permalink. I wrestle with SSS too..but I have found that on a more intricate pattern, the second one is more fun cuz I know what’s coming.. The picot cuffs are a nice touch for an otherwise vanilla sock. Apart from the fun, unvanilla colors. 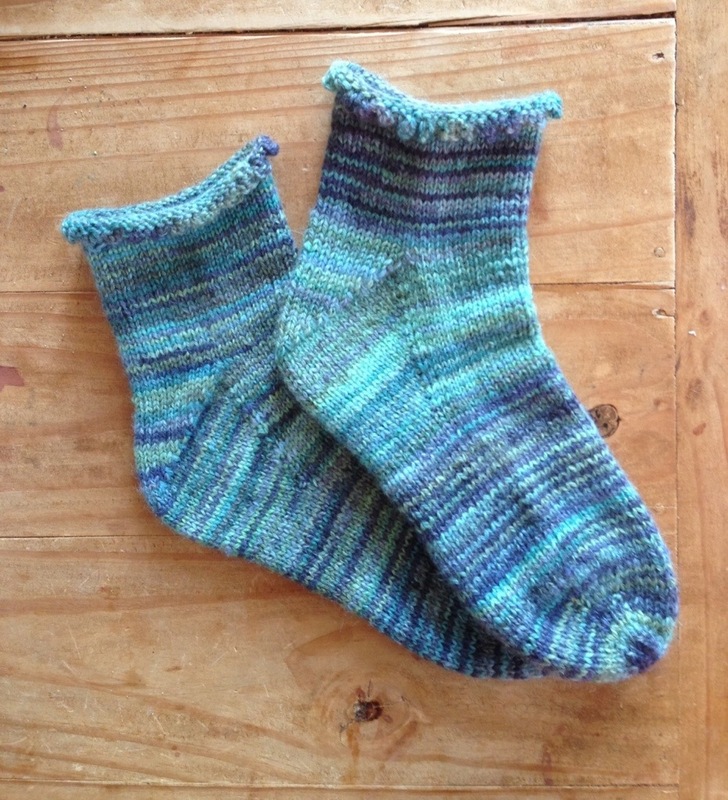 I’ve never knitted socks from my handspun. I don’t trust myself to spin something smooth and regular enough. I’m worried there will be little microscopic irregularities that would irritate my feet. So ridiculous. Thanks! You know..I was worried about lumps and bumps too, but it just hasn’t been a problem–even with a Navajo ply. Go for it!! Love love love the edging! Thank you! It’s my new favorite for plain socks! Stretchy, too! I love those socks! I have yet to make yarn from my spinning, well, I have singles that are waiting to be plied but I haven’t attempted plying yet… newbie that moves cautiously and sort of slowly. I also have yet to attempt knitting a sock… It’s on my list though! LOL! Plying is one of the best parts of spinning..I love it! 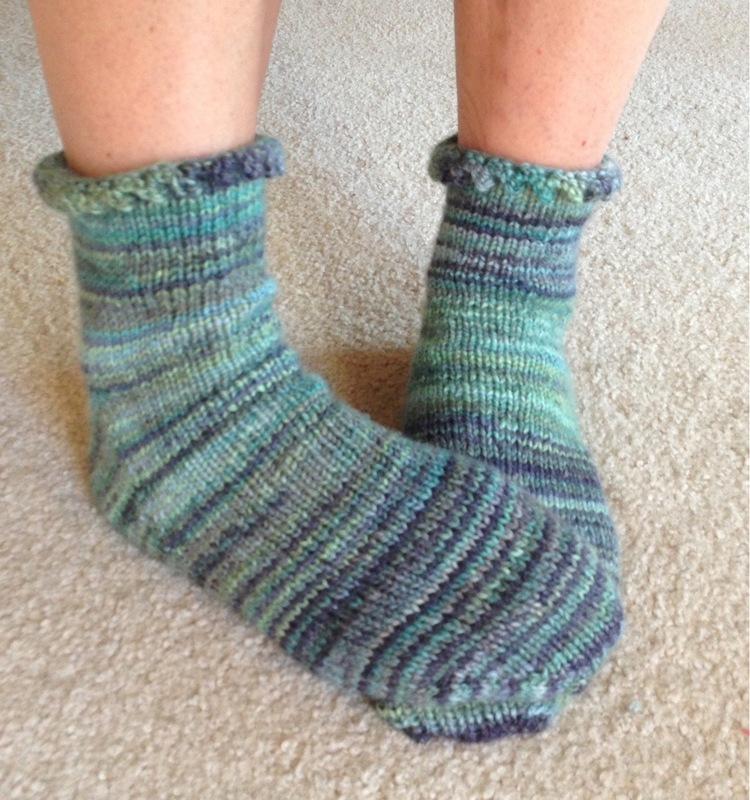 And simple socks are really awesome…fun to knit and you can be really creative!